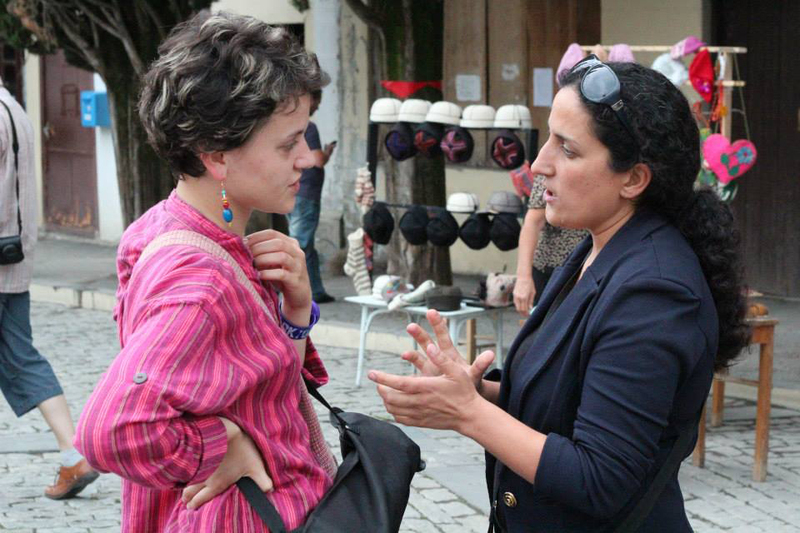 Madona Batiashvili is the only woman Vice-Mayor in Georgia’s Kakheti region. It’s a platform she uses to make sure everyone has a voice. Having been appointed in 2017, her first steps in office were to engage and empower two groups that are often marginalized from politics in Georgia: young people and women. Madona is one of more than 500 NIMD Democracy School graduates in Georgia. When she joined the School in 2016, she found herself in a melting pot of students from a whole range of backgrounds. Public servants, civil society representatives, political party members, business representatives and academics gather in the schools annually. Over the five-month training period, these participants deepen their understanding of the key concepts of democracy, expand their analytical capacity and gain relevant skills that will help them make effective changes in society. Georgia’s four Democracy Schools – based in the cities of Telavi, Gori, Kutaisi and Batumi – are playing an active role in enhancing political culture and building the capacities of civil society and political leaders at the local level. This is what enticed Madona to sign up for the Democracy School – she wanted to learn alongside people who shared her ambition to make a difference. 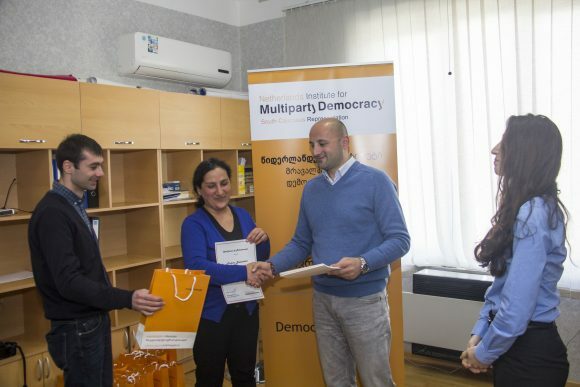 Madona graduates from the Democracy School. When Madona first started at the School, she found it hard to work and learn together with people from different political affiliations. But she soon realized that interacting in such an environment was actually beneficial for her. The Democracy School debates equipped her with the skills to think through her own arguments and tolerate critical and diverging opinions. This new perspective made a crucial difference when she started working in her high-position public service role. She was determined to open up to the public, closing the gap and calling for inclusion of the different groups she represented. In fact, one of Madona’s first moves as Vice-Mayor was to establish contacts with young people. Youth engagement in local self-government is very low in Georgia, and young people are often disenchanted with politics. That’s why, having reached out to youth in her region, Madona set about making amendments to the local budget, creating funds for initiatives by local youth organizations. These funds will take the form of grants, which will be opened up for applications from all youth organizations in the region. Madona firmly believes that the engagement of youth is vital to securing a prosperous future for her region. 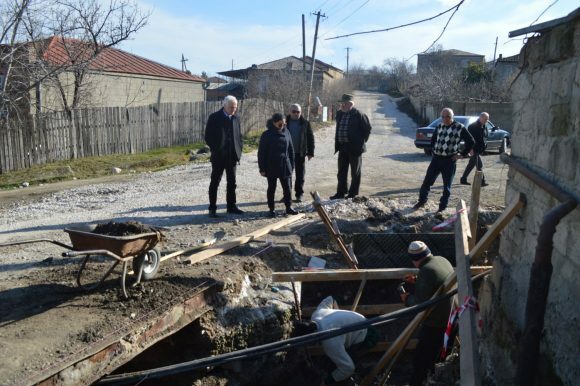 She hopes that the new funds will help young people engage in politics, realize their potential, find jobs locally and, ultimately, stay in Kakheti. Another issue Madona feels strongly about, having attended the Democracy School, is women’s rights. Women’s political participation in Georgia is alarmingly low. Women hold only 16% of seats in the Parliament of Georgia, while less than 12-13% of elected officials at the local level are women. Men head 63 out of the country’s 64 municipalities, including the eight in Kakheti region. In her new role, Madona is determined do her best to ensure that active and successful women are given the opportunity reach their full potential. And she has already taken action to make this a reality. In an attempt to offset the large number of men in politics, Madona has recommended several women as representatives of the Mayor in villages. By bringing more women into these local roles, Madona hopes that she will give them a voice and help them to make a difference in their communities too. Madona is determined to use what she has learned to make this difference. Through the Democracy Schools in Georgia, NIMD’s goal – along with our partner EECMD – is to empower more people like Madona to become leaders in their communities and make effective changes in society. More on NIMD’s Democracy Schools around the world here.